Beogram 1203 was an automatic, high-fidelity stereo record-player with high specifications. It was beautifully-styled and extremely easy to operate. All you need to do was select the record size: 7", 10" or 12" and press a button. 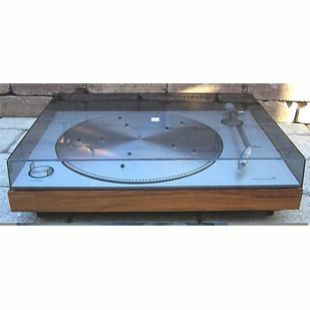 The turntable automatically selected the correct speed: 33% or 45, and the pickup was lowered into the first groove. At the end of the record, the arm automatically returned to its resting position and the turntable switched off. Beogram 1203 was fitted with its own pick-up cartridge, the SP 14A which had a spherical diamond stylus and a stylus pressure of 2g. Its frequency range was 20,000 Hz. ±3 dB. Distortion was lower than 1%, wow and flutter lower than ±0.15 % and rumble better than 58dB. The turntable and pick-up arm had a pendulum suspension which made the record-player insensitive to vibrations. A transparent dust lid and a spindle adaptor for playing centreless records were supplied with Beogram 1203. It was in fact rather simpler than its immediate predecessor, the 1202 , and was based on the Beogram 2000 rather than the top of the range 3000. Beoworld says: slightly simpler version of the 1202, with many of the same virtues and vices. Beogram 2000 is very similar but has the advantage of a hinged lid.